Auto Transformer Applications Advantages Disadvantages Limitations and Connection. 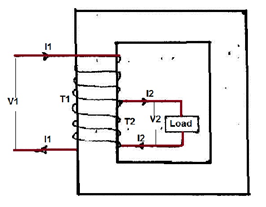 Today we will discuss hot topic of Electrical Transformer topic i.e. Auto Transformer. At least one questions always comes in any competitive exam. One numerical problem always asked in GATE exam. So GATE 2018 point of view its important topic. Many time its application or advantages asked as a Objective type Questions. So dear reader read full article. voltage can be smoothly and continuously varied. 4.Used in HV Substation due to following reasons. weight, more copper and high cost. Harmonics and voltage unbalance are eliminated. magnetic separation like two winding transformers. 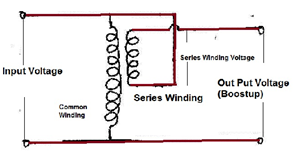 part of windings is common to both primary and secondary is called Auto Transformer. 3.In Auto Transformer two windings are magnetically coupled as well as electrically coupled. output voltage can be varied by changing the tapings. 5.Due to a common mutual flux the primary and secondary windings of transformer induced emf and are in phase. 6.The currents run by these two windings are out of phase by 180◦. 7.The common section need to have a cross sectional area of the conductor to carry (I2−I1) ampere. 9.A current of I1 ampere flows through the winding between B and C. So the current in the winding between A and B is (I2 − I1) ampere. The cross section of the wire to be selected for AB is proportional to this current assuming a constant current density for the whole winding. 10.Thus some amount of material saving can be achieved compared to a two winding transformer. of turns. This ratio therefore the savings in copper. 12.As the space for the second winding need not be there, the window space can be less for an auto transformer, giving some saving in the lamination weight also. The larger the ratio of the voltages, smaller is the savings. As T2 approaches T1 the savings become significant. Thus auto transformers become ideal choice for close ratio transformations. 13.The auto transformer shown in Figure is connected as a boosting auto transformer because the series winding boosts the output voltage. connected to these windings cannot be isolated. reason, autotransformers are very seldom connected as ∆ – ∆ transformers. 1.There are copper savings in size and weight. 3.Lower series impedances and better regulation. compared with the conventional transformer. 5.Its size is relatively smaller. 7.Lower cost due to less use of copper. 9.In conventional transformer the step up or step down voltage is fixed while in autotransformer, we can vary the output voltage i.e. increase or decrease as per our requirements. 1.Not available with three-phase connections. 2.Higher short-circuit currents can result from a lower series impedance. 3.Short circuits can impress voltages higher than operating voltages across the windings of an autotransformer. Comment in my blog if you like my article. Comment if any topic you wanna i discuss here. Share to your friends if you like the content.